Add to Cart Quantity Label Override: How many GBs to Back Up? Back-up your media items stored in Cloud collections onto Blu-ray M-DISC, 50 or 100GB Blu-ray Discs, or LTO-6 Tape for additional redundancy protection of important files. 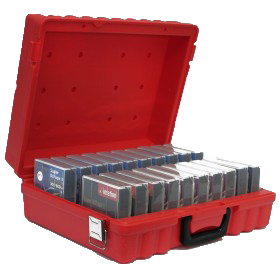 Digital files backed up to Blu-ray Disc or LTO-6 tape. Pricing is based on the number of GigaBytes (GBs) to back up. Pricing starts at $25 for 5GB, the minimum order. Shipping & handling charges apply on orders less than $100. Return Format and Media types - We return your backup copy on a Blu-ray Disc, utilizing either an M-DISC (25GB), Dual Layer (50GB) or Triple Layer (100GB) version of the Blu-ray Discs. When the amount to back up exceeds 500GB, we may use LTO-6 tape. 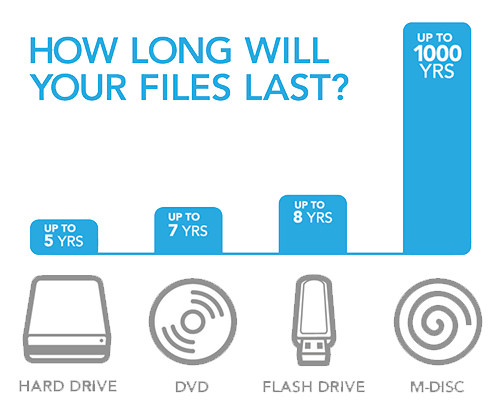 The media we use depends upon how much storage space is needed to back up your cloud collections sent to Cintrex. Blu-ray M-DISCs are rated to last up to 1,000 years and are used for the smaller amounts of data. Both the Blu-ray M-Disc, dual and triple layer Blu-ray Discs, and LTO-6 tapes are excellent backup options, used by corporations and serious-minded archivists for long term backup of important files. How it works: Submittal of your order to Cintrex is a two-step process - entering the order in our online store and copying the assigned order number, and then emailing us the links to shared collections with the order number pasted in the email's subject line. The email should be sent to order-entry@cintrexav.com. If you don't know, enter the number 1, and we will contact you if we receive more than 1GB. We won't start the order until you approve the new amount. We do not bill your credit card until your order is completed and we are ready to return the Blu-ray Disc or LTO tape to you. Email us at order-entry@cintrexav.com with the newly assigned order number in the subject line, and links to your cloud collections (Dropbox, iCloud, LightJar, etc). With receipt of your order and your emailed links to your collections, Cintrex will place a copy of all content from your downloaded collections onto the appropriate archive media: and ship the discs or tape to the subscriber for safekeeping. Future retrieval of the content is possible with the appropriate media reader, an LG Blu-ray drive for the Blu-ray M-DISC, or a LTO-6 tape drive from DELL, HP, IBM, Quantum, and others. Local area vendors will also have the appropriate media readers. Turnaround is 1 to 2 weeks after receipt of your order.